When I first started trying vibrating mascaras last year, I didn't know quite what to expect. But after loving them all (check out my review of Lancome Oscillation here), is it any wonder that the new Lancome Oscillation Powerbooster Mascara Primer would make me feel the same way? I've tried this mascara primer under three different mascaras, and every time the results are the same. Mascara that sticks, lasts and looks as good after 12 hours as it did after the first. Not to mention there's no clumping, flaking or unsightly smudging to be seen anywhere. No, this primer really and truly works. And just how does it work, you might ask? It's very similar to its Oscillation Mascara counterpart. Continuous vibrating motions make the wand rotate a full 360 degrees for maximum impact. I recommend holding it steady instead of zig-zagging and applying with a light hand so the product goes on evenly with no clumping. You'll be left with conditioned, strengthened, fortified, prepped and primed lashes that are separated, coated and ready for a coat or two of mascara. And if you're too afraid of the vibrations? It has an on-off button, unlike some of its vibrating counterparts, so you have the choice of applying it without them! 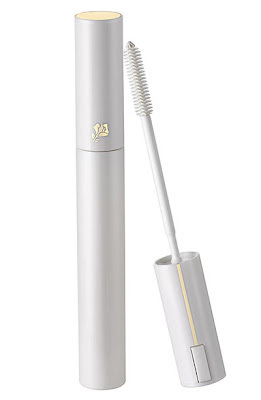 Lancome Oscillation Powerbooster Mascara Primer retails for $40 at lancome.com. Thanks for such an awesome blog.. I love the look, feel, and your tone. We write similiarly.. I too am a Beauty Junkie and have my own blog - www.romyraves.com and would looooove to know what you think.. Thanks again for a wonderful post and blog.. I won this from The Lancome Blog and I absolutely LOVE it! It makes my lashes look so much better!